Yes, it’s a Mood Berry quilt! Our latest mosaic contest was inspired by the palette of my then work-in-progress. Now this trip around the world quilt is finished, and I’m excited to share the results! Yay! I do love a finished quilt. This one is really hitting the spot for me, color-wise. The color palette is rich and moody, with plummy purple, flashes of red and lots of gray and black. Notes of gold and blue are also sprinkled throughout. This quilt a mash-up of all my friendly linen, canvas and barkcloth scraps. I had a good amount of small-sized yardage and scraps in substrates heavier than quilting cotton. With a similar weight and interesting textures, they mix together quite nicely. If you’re looking to do something similar with mixed substrates, don’t forget to sew an extra-wide seam allowance and quilt the work on the denser side to ensure durability. The simple patchwork style of this quilt seemed to invite something a little more visually complex for the quilting. I opted for Curls Allover quilting. It’s a gentle, but playful design that would really suit a lot of quilts, I think. Every Week it’s a new treat! Pick up Fall Goodness, an 8-piece Fat Quarter bundle, at 15% off regular price this week. Quilt Sandwich hand picks a new bundle each week, mixing different collections and designers to create a one-of-a-kind bundle. Offered at a discount for one week only! Do you have any fabrics that it’s hard to part with? I’m that way with my Good Folks stash. Fortunately, I managed to let go of a Good Folks print that was so perfect for this quilt back. It’s the large scale floral with pink and gray stripes on the left. It fit the mood of things too well to resist. I also used some Essex linen, Outback Wife barkcloth and Chicopee corduroy on the back. It’s quite a lovely round up of textures and then the fun swirly quilting… I do hope someone loves it! Mood Berry Melody is a 64” square quilt with 3 1/4” finished patchwork squares. It’s bound in Art Gallery Oval Elements, finished with my go-to zigzag binding stitch. If your sofa could use some Quilty love, act fast because this one’s listed in my Handmades shop today! 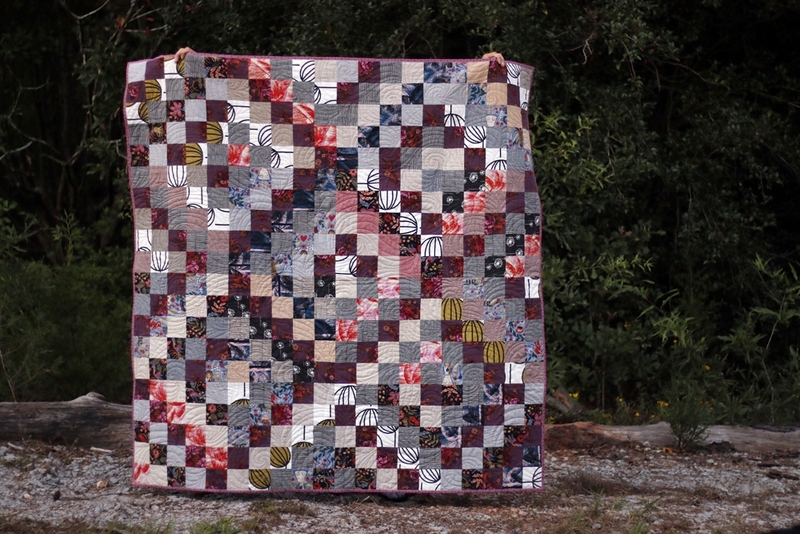 And bonus, I’ve also listed my remaining scraps from this Mood Berry quilt. The point was to actually clear that particular scrap bin, so I don’t want to put these back! Haha. The Scrap Pack (now sold) contains a range of sizes and nothing too small to use. I’d guess you could make a pair of patchwork pillows with this amount. Or get creative by adding your own mixed substrate scarps and see what happens. Have fun!